This is obviously not a health food blog. 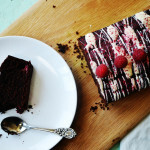 This is a celebratory blog – an equal opportunities blog, where a glorious sponge cake decorated with fudgy frosting is given the same happy reception as a bright salad studded with seeds and fresh fruit. I have no personal need to focus on ‘free from’ food, I am far from a vegetarian, and I believe in eating and enjoying a huge range of things. Really, I just want things that taste good. 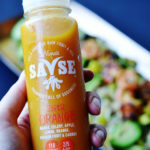 That’s why I was delighted when Savse got in touch and asked me if I’d like to participate in a collaboration with them, using their smoothies to devise new recipes. One of the rather lovely things about this sort of task is that you get sent products to experiment with and, lucky old me, these smoothies are completely delicious. They are cold-pressed and natural, with no added sugar, so great to have as a little energy booster and a helping hand towards your five-a-day. 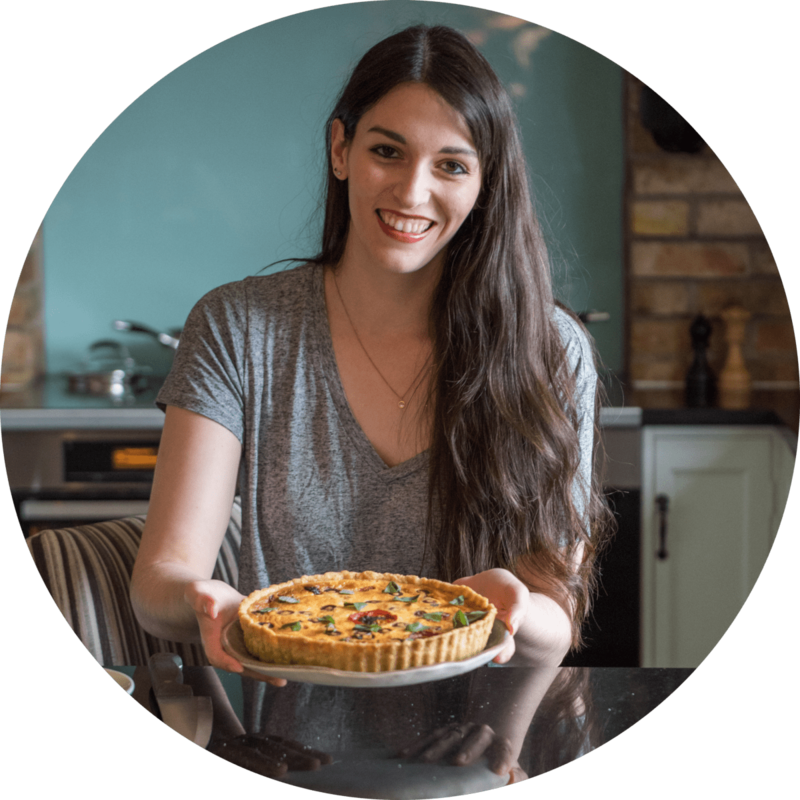 I’ve started with a savoury recipe, which is a little more of a challenge with a fruit based smoothie, but one which I had lots of fun experimenting with. This duck dish is great because it looks fancy if you want to impress someone, but is actually full of really simple processes. The amount served here is enough for a light main course – think elegant lunch or a dinner after which you would like to eat a generous pudding – but could easily be bulked up if you were hungry by cutting the potatoes into chunky wedges instead of cute little cubes. The thing that really makes the dish is the sauce. 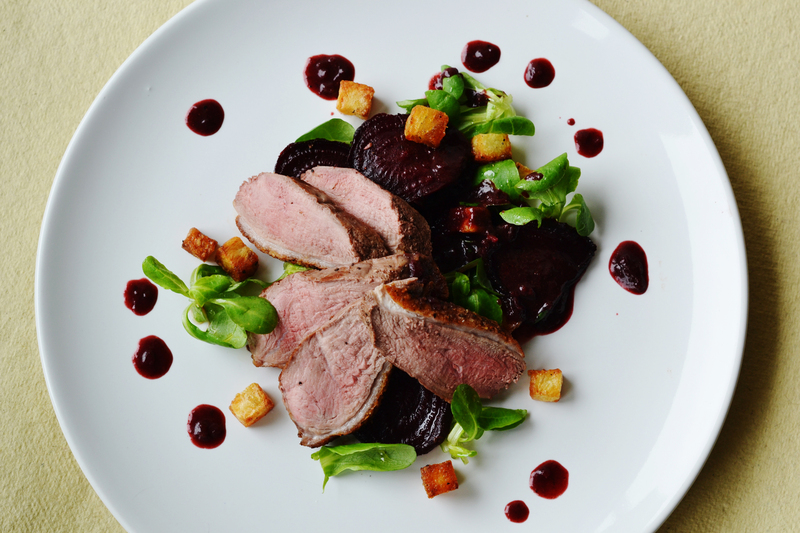 Everything else is tasty, but commonly found: pink duck breast with a meltingly crispy skin; golden little mouthfuls of salty potato; earthy-rich beetroot; delicate, fresh lamb’s lettuce. The sauce, though, is stuffed with intriguing flavours. 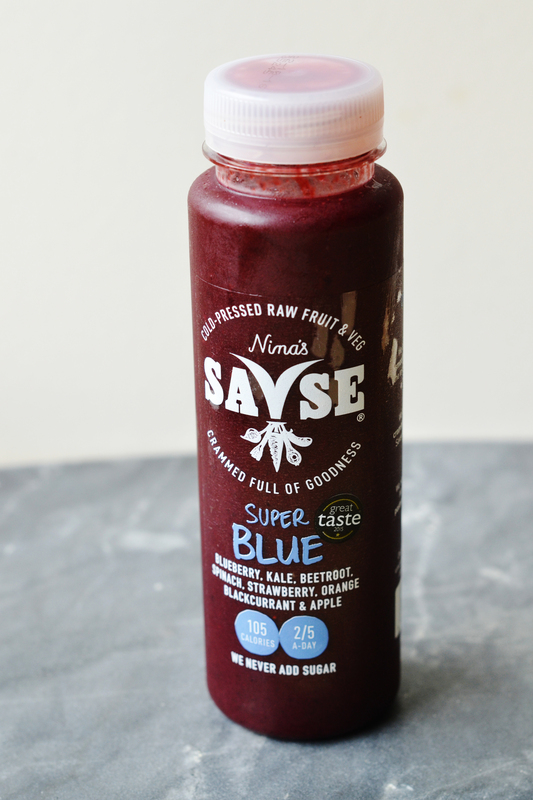 Its base is the Savse Super Blue Smoothie, which is packed full of (deep breath) blueberry, kale, beetroot, spinach, blackcurrant, apple, strawberry, and orange. With all that going on, no wonder it makes such a rich and complex sauce. I took my inspiration for the recipe from the fact that lots of the ingredients in the smoothie are great tried-and-tested partners for duck – blueberry, beetroot, spinach, orange – and went from there. Happily, after my recipe-testing session, the plates were practically licked clean. 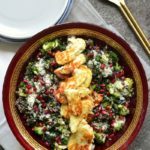 Notes: The sauce is the key element of this dish, and it’s the thing you need to pay most attention to. 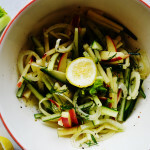 Taste it as you are going along – I am giving rough guidelines in terms of ingredients here. Add more or less of anything to your own personal preference. If you would prefer to make big chips rather than little potato cubes, you should par-boil them in salted boiling water for five minutes before oven-cooking them, otherwise they might not cook through in the time it takes to prepare the rest of the dish. The quantities given here will serve two people. Heat your oven to 220C/200C fan/gas 6. Peel your potato, and dice it into little cubes. Slice your pre-cooked beetroot into rounds. 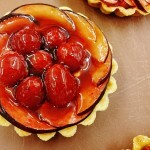 Place the beetroot on one side of a roasting tray, the potato on the other, and drizzle both with oil. Season generously. 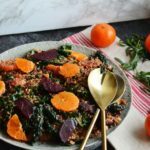 Place in the oven to roast for around 20 minutes, or until the beetroot is darkened and crisped at the edges and the potatoes are golden and cooked through. Season your duck breast and place it skin side down in a cold, non-stick frying pan. Do not add oil. Put the pan on a medium heat and let the fat under the skin of the duck slowly render down for about 10 minutes – the pan will fill with the natural duck fat and the skin will become golden and crisp. Check it every now and then to see it’s not burning. While this is happening, finely dice your shallot and crush your garlic. When you’re happy with your duck skin, turn the duck breast over and quickly brown it on the flesh side for 1 minute, and then put it on a roasting tray, skin up, in the oven with your potatoes and beetroot for 10 minutes. (Note: this should give you lovely pink duck, but obviously depends slightly on your oven and the thickness of your meat). When the duck is done, take it out of the oven and let it rest for at least 5, preferably 10, minutes, while you finish off the dish. Wipe out the frying pan you used for the duck, heat a splash of oil on a medium heat, and soften your shallot. After 3-5 minutes, add your crushed garlic. Cook for 1 minute, then add your bottle of smoothie. Turn up the heat and reduce the liquid down. Add the wine, vinegar, and plenty of seasoning, as well as any juices from the resting duck. Keep tasting it and adjusting according to your preference. You’re looking for a thick, dark, glossy sauce. 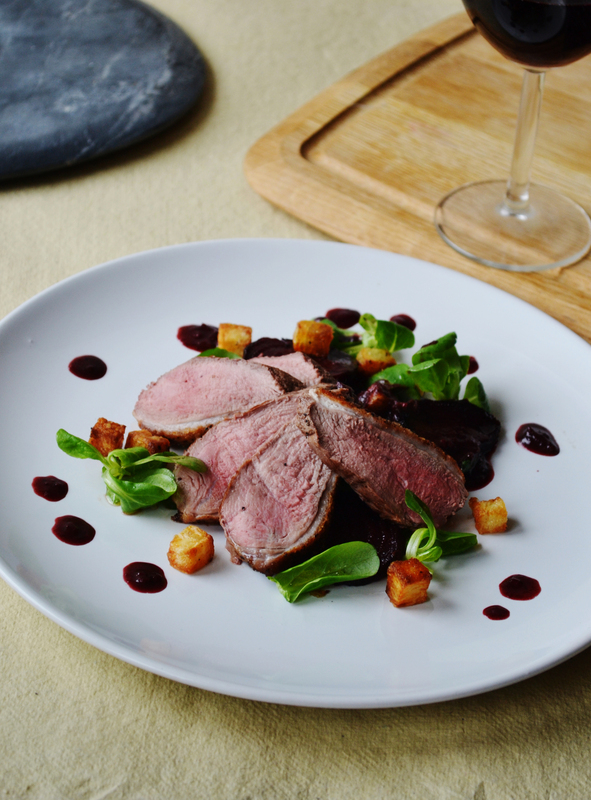 Slice your rested duck and serve with crispy potatoes, roast beetroot, salad leaves, and a drizzle of sauce. Finish off by pouring the rest of the sauce over your duck.